Happy Daily 044 – From an undisclosed location in Washington DC. On today’s Happy Daily: Live from Washington DC! On today’s Happy Daily: A fine gentleman today told me a story that changed my life, and I hope it changes yours too. 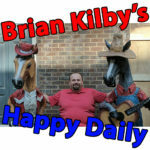 On today’s Happy Daily: It’s a day in the life of Brian Kilby. On today’s Happy Daily: I’ve got the most exciting and scary news of my short Goose Control career, y’all. Life’s moving too fast! On today’s Happy Daily: It’s the most exciting, challenging, and encouraging day at work yet! Happy Daily 039 Brian’s New Toy? On today’s Happy Daily: Brian has found the truck of his life, y’all. And it ain’t a Ford. What happened!? On today’s Happy Daily: Our series on the Great Wilkes County Sinkhole is over, and now we are answering listener questions. On this episode of Happy Day in Wilkes we present to you our full report on the Great Wilkes County Sinkhole which appeared over the last three days on the Happy Daily. On today’s Happy Daily: It’s our third and final part of our series on the Taco Bell Sinkhole with correspondent Howard Vannoy from Wilbar! On today’s Happy Daily: The second part of our series on the Taco Bell Sinkhole with correspondent Howard Vannoy, from Wilbar. On today’s Happy Daily: The first part of our series on the Taco Bell Sinkhole with correspondent Howard Vannoy, from Wilbar. We also have a Goose Control question from a listener. Check out part 2 of our series on the Taco Bell Sinkhole! On today’s Happy Daily: What kind of future are you going to leave the next generation? I’m not certain how happy today’s Happy Daily is. Happy Daily 032 September 18th 2017 What constitutes a Goose Control Emergency? On today’s Happy Daily: For immediate release, Brian Kilby might solve a major Wilkes County government issue and create a new market in Wilkes County.